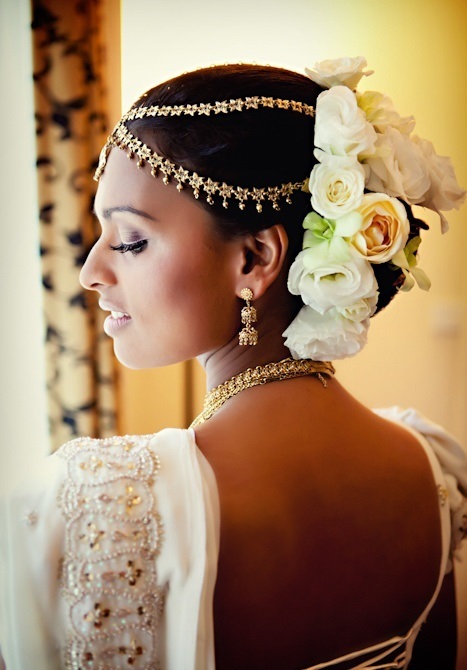 An integral part of the bridal look is the hairstyle that accentuates the face contour as well as the facial features. After all, it’s your wedding day, the most beautiful day of your life and you got to feel like a princess! Would-be-brides tend to underplay their hair. I mean a lot of attention is paid on their wedding attire, makeup, jewelry and footwear but hair is often neglected. For some reason, there is not much effort put in on the hairstyle and it is often wondered why. I have often seen brides deciding on a regular bun without really thinking much about the fact that buns are done-to-death. So what even if the large chunk of your hair gets covered? 1. Updo: Instead of a boring updo, go for a sleek and trendy bouffant updo or add a few elaborate curls and make it into a Spanish updo. 2. Side bun: Try a low puffed-up side bun and not a plain side bun. 3. 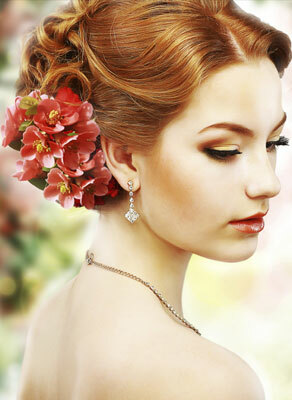 Pinned up bun: Embellish the pinned-up bun with shiny hair accessories or floral arrangement. 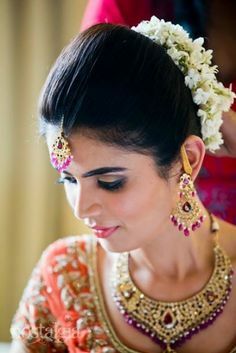 These buns look super cool and stylish with a saree and lehenga. Besides, they also highlight the maang tikka, jhoomar and other head gears/ mandatory jewel pieces. If you are opting for a salwar kameez and particularly on a mehndi night, try out the much-in-vogue braid. Gorgeously done with a few hair accessories or scented flowers to add to the style. Pretty flowers such as orchids, roses, marigolds or a bunch of jasmine complimenting the color of your outfit. Now! That is sure to add so much style to your pre-bridal ceremonies. Even with braids, you can be creative. Try out a single-strand which can be worn really loose, a messy Dutch style or a French reverse, a twisted four-strand braid in a bun or a simple one done sideways. However, if you are not up for a bun or a braid but want to really experiment with your long, flowing tresses then go for a bohemian hairdo. Just be ready to tame your manes in Velcro curls. This style can’t do much without an excellent piece of hair accessory. A pretty looking head band or a stylish jhoomar can glorify the entire look. Zuri suggests you must wear this on a pre or post-wedding party, preferably with a gown or an unconventional, ethnic outfit.